Isn't that birdie adorable, the bird, branch, leaves and heart edge are from the die set and the stamped bird and sentiment is from the stamp set. That heart edge is so cool, love how you can use it for landscape. I was actually playing around with my new Kuretake Gansai Tambi watercolors and liked how it look so I made this tag, I love this sentiment!! I stamped the bag real quick to match the tag using the Build A Chevy Background Stamp. I love how you did the rainbow water colouring =) And the birds are really cute !! ING Miss Brigit your Card is so darling and your Tag is so sweet...OMG today's Sneak Peek so rocks and girl you did it proud...I love your watercoloring and how you used all of Miss Emma's goodies! You totally did two outstanding creative jobs. YOU so ROCK!! love the card and tag!!!! So beautiful!!! Very cute card and tag - can't wait for this release! So darling!! Your projects are so sweet and that little bird... just darling!! Your birdie card is so sweet, love the watercolored tag! It is gorgeous. Adorable card! I love how you used the heart edge die to separate the sky from the grass! And your tag is gorgeous!!! Brigit both of your projects are so stinkin cute! I love your sweet Thank you card as well as the adorable tag! Great inspiration! I love the water coloring. The bird is darling. Your card and tag are adorable. LoVe your sweet tag color. Thanks for sharing. Love your card and tag set. Clever idea to stam the bag. I love the gift tag you created! LOVE LOVE LOVE your sneaks today Brigit! Such a cute card and tag. LOVE...the tag is so pretty!! A gorgeous card and a very SWEET treat! !I adore the tag as well as the wonderful sentiment!! I love the watercoloring on the tag on your second card! Absolutely beautiful! Thank you for all your great inspiration this week! Love all the layers on your card. Beautiful! Great tag too! These are Beautiful!!! Love LOVE your tag! your card is so pretty, but your tag stole my heart, is so beautiful! I really like how you used the heart string die for horizon line and how cute is that bird and branch! The color on your tag is beautiful and love the chevy on the bag. Great job! Beautiful tag, u did a great job! Brigit ~ Well isn't your birdie card simply ADORABLE!! I LOVE how you did the heart above the hill top ~ so borrowing that idea too ~ and oh my that background ~ EEK! Did you ink that?? Sigh! Then your glassine bag ~ that seriously is an AWESOME idea for a friend who needs just a little extra something! BEAUTIFULLY done! Wow, your projects are beautiful. I love that little bird!! Love the heart on the hill. Darling scene. Hope the birds will be here soon. Gorgeous water coloring on your tag! I love it! Your card is super cute as well! That little birdie is so adorable! Cute card and tag. I like the scene you created on the card. What a darling scene card- love the heart on the hill. I just love the tag with the watercolor background. The birds are so cute! 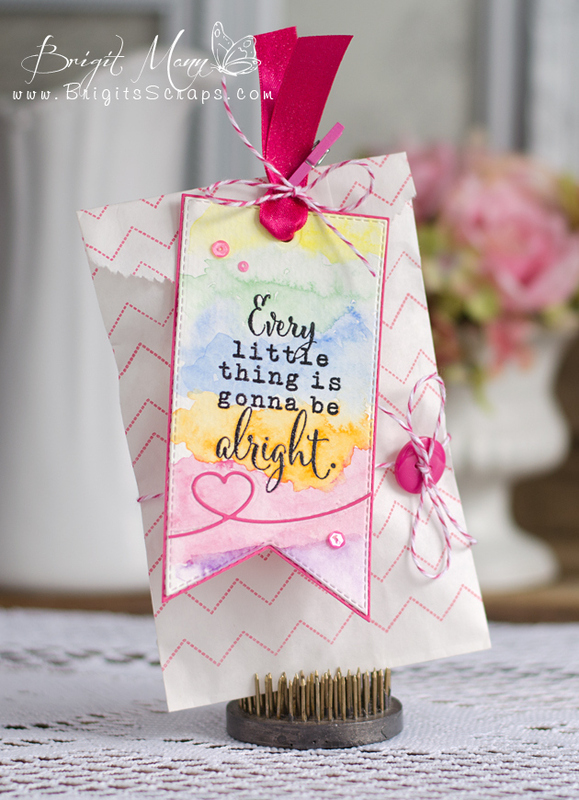 Beautiful sentiment stamp! Love your colors! the birdie card is so cute, love the "heart" hill! oh my, your tag is stunning!